The Merchant City has benefitted from a long-term regeneration strategy which has had an extremely positive impact on the area, and the city as a whole. Mixed uses, retail, galleries, bars, restaurants and residential provide activity and a sustainable economic future. It is this combination and level of activity which keeps the buildings in use, making the most of the heritage. The High Street is predominantly made up of small business and retail units with storage/residential above, and large new developments of flatted housing and student residences. There are a lot more gaps and real opportunities to improve the look and feel of the streets that we are asking residents and visitors to use. There is a train station at High Street which serves local trains on the North Clyde Line. 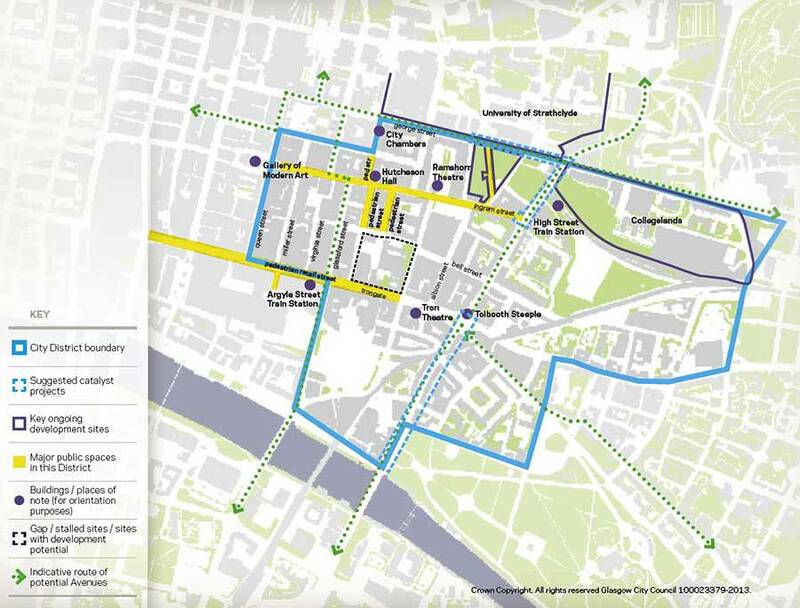 This area will be subject to more transformation with the development of the University of Strathclyde. Under its redevelopment proposals the new campus will see George Street as its front door and business face. While undergoing this transformation, it will be important to maintain people-focused design at the heart of proposals for new and transformed streets and spaces. There is huge potential in a thriving student population and this has to be realised. Find out the latest news about the Merchant City here.